I received a free full-size box of Culturelle Kids Daily Probiotic Packets from the Culturelle Clubhouse! The Culturelle Clubhouse sign up is still open! Sign up now for future freebies like this one! I received a free full-size jar of IT Cosmetics Bye Bye Under Eye Eye Cream! I already use the IT Cosmetics Confidence In An Eye Cream, so I was very excited to give this one a try - especially since I've recently noticed some dark circles creeping up on me (boo). I haven't been using it long enough to see any long term effects, but it is very moisturizing, works great under makeup and the blue tint does help with the dark circlec. I'm looking forward to seeing the benefits after a few weeks. This is still available! I received a free sample of Clorox Ultra Clean Disinfecting Wipes from PINCHme! The next PINCHme Sample Tuesday event is May 14th! Be sure to sign up if you're not already a member, so you can take part! I received a free pack of Organic Green Bean Seeds from Tasty Bite! I'm an avid gardener & look forward to the free Tasty Bite seed giveaway each year! I've already started the seedlings in my sunroom and can't wait to get them in the ground! This is still available - Get your free Tasty Bite Organic Green Bean Seeds! 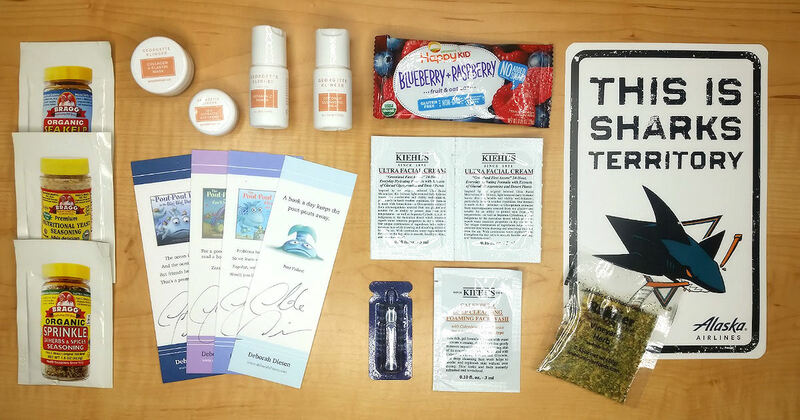 I received a sample box from SMN & Sampler! This time it included a free box of Modern Table Rotini Complete Protein Pasta and Spice Hunter Global Fusions Rub in Spicy Garlic flavor! There are new samples added every month, so be sure to log in and see what free samples are available for you! I received a free 3 bar sampler of Bob's Better Bars from Bob's Red Mill! It included: Peanut Butter Coconut & Oats, Peanut Butter Chocolate & Oats and Peanut Butter Jelly & Oats flavors! These are so yummy and each flavor is very pronounced without being overwhelming. Everybody in my house agrees I should pick these up next time I'm shopping! I received a free fragrance sample of Dolce & Gabbana Light Blue! It has a light, fresh scent and is my favorite scent from Dolce & Gabbana! 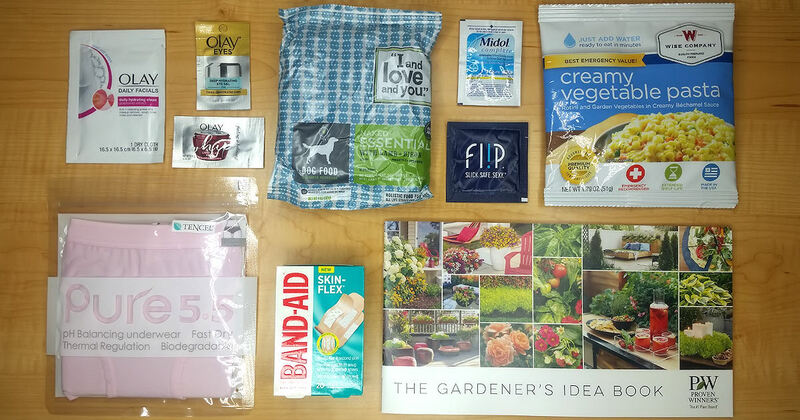 *Have you received any HOT free samples or goodies in your mailbox? We'd love to hear about it - post your own photo or leave a comment telling us all about what's arrived for you! I received a free copy of the 2019 Gardener's Idea Book from Proven Winners! The book includes tons of ideas for your garden, backyard, landscaping, outdoor entertaining, planting, growing etc. It includes some beautiful photos and really cool ideas - some of which I'd like to try in my backyard! The free 2019 Gardener's Idea Book is still available! I received a free sample of FLIP Personal Lubricant! They also included a 20% off + free shipping promo code! The free FLIP Lubricant is still available if you missed out when we previously posted it! I received a free sample of Wise Company Creamy Vegetable Pasta! Wise Company provides survival food & emergency food storage and with most of their meals you only need to add water. This free sample offer is still available! I received a free sample of Midol Complete and a $2 off coupon! I was able to use this yesterday and it helped to alleviate some of the symptoms I was experiencing and it worked fast! I am definitely using the coupon to purchase a bottle of Midol Complete! I received a free Olay Sample Bundle! It included: Olay Daily Facials Cleansing Cloths, Olay Eyes Deep Hydrating Eye Gel and Olay Regenerist Whip Moisturizer! I am loving all 3 of these products! The cleansing cloth works great to remove makeup and grim from the day while exfoliating without stripping my skin! The eye gel has a cooling feeling which feels amazing when you apply it and the whip moisturizer is light, but hydrating. This offer is gone right now, but it should be available again soon! I received a free sample of I and Love and You Naked Essentials Dog Food with lamd + bison and a $5 off coupon! I received a free full-size box of Band-Aid Skin-Flex Bandages from Home Tester Club! I received a free pair of Pure5.5 pH Balancing Underwear in a light pink color! I received a free This is Sharks Territory Sign from the NHL San Jose Sharks and Alaska Airlines! Kiddos and Sharks fan will love this sign & it can be hung anywhere! This free Sharks Territory sign is still available! I received a free Georgette klinger Skincare Sample Pack! It included a Georgette Klinger Coconut Cleansing Milk, Vitamin C Toner, Sea Extracts Eye Cream & Collagen Elastin Mask! Still available - order your free sample pack now! I received a free Bragg Delight Seasonings Sampler! It included a free Bragg Organic Sea Kelp Delight Seasoning, Nutritional Yeast Seasoning & Organic Sprinkle Seasoning! The free Bragg samples are still available, so sign up now if you missed it last time! I received a free Sampler Parent Cabin Sample Box! 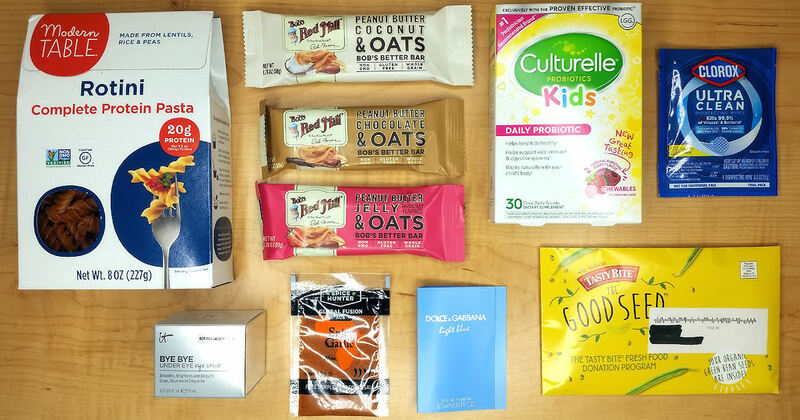 It included a Happy Kid Blueberry & Raspberry Fruit & Oat Bar and a $1 off coupon and a Kiehl's Skincare sampler! The Kiehl's samples included 2 Kiehl's Ultra Facial Cream Packets, Kiehl's Calendula Deep Cleaning Foaming Facial Wash, & a small sample bottle of Kiehl's Midnight Recovery Concentrate! I received a free set of Deborah Diesen Autographed Bookmarks! It included 4 bookmarks each featuring a different Pout-Pout Fish book! The free autographed bookmarks are still available! I received a free sample packet of Rainier Foods Seasoning in Vineyard Herb! It is a combination of different herbs, spices and a touch of wine flavor! I used it in the breading for my breaded porkchops and it was a huge hit - very tasty! 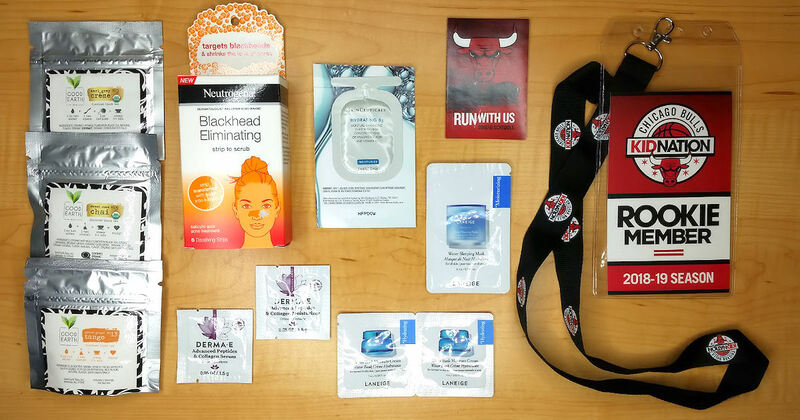 I received a free Chicago Bulls Rookie Kit! It includes: Bulls Kid Nation Member Certificate (not shown), Kids Club Passport & Chicago Bulls 2018-19 Pocket Schedule! This freebie is still available! I received a free Laneige Skincare Sample Pack from Allure Try it Sampling Program! The free samples include: Laneige Water Sleeping Mask & 2 free sample packets of Laneige Water Bank Moisture Cream! The registration link is still open, so sign up now if you're not already a member and you can take advantage of future free samples like this one! I received a free sample of SkinCeuticals Hydrating B5 Gel Serum! This serum is super hydrating without clogging my pore - love that! The free SkinCeuticals Serum sample is still available - order yours now! I received a free full-size box of Neutrogena Blackhead Eliminating Strip to Scrub Pore Strips from Home Tester Club! I've tried other pore strips int he past, but these are the first that are a 2-in-1 (pore strip + face scrub)! I received a free Derma E Skincare Sample Pack! It included a free sample of Derma E Advanced Peptide & Collagen Serum and Derma E Advanced Peptide & Collagen Moisturizer! Plus a $2 off coupon! I received a free sampler of Good Earth Tea! It included a free sample of Earl Grey Creme, Apricot Ginger Tango & & Sweet Rose Chai! I'm an avid tea drinker, so I am looking forward to trying all 3 of these! They sound so tasty!